Putative stem group representatives of the Rheidae were reported from the Paleocene of South America, with the earliest fossils being pedal phalanges from the middle Paleocene of the Río Chico Formation in Argentina (Tambussi 1995). 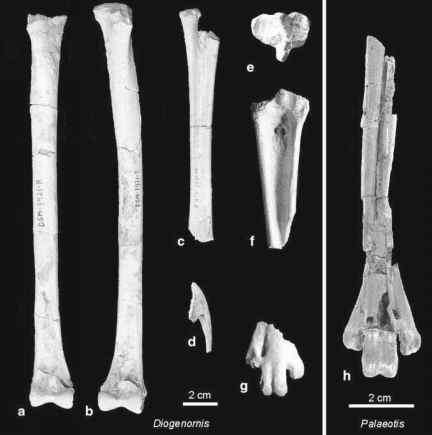 More comprehensive is the fossil record of Diogenornis fragilis Alvarenga, 1983 from the late Paleocene of Itaboraí in Brazil, a flightless species which reached about two thirds the size of the extant Greater Rhea, Rhea americana. Various limb bones, vertebrae, and the tip of the premaxilla were discovered and represent a minimum of four to five individuals (Fig. 5.2; Alvarenga 1983). In the original description, Diogenornis was assigned to the Opisthodactylidae, a taxon which was first erected for a species from the early Miocene of Argentina. Because the similarities between these early forms are, however, likely to be plesiomorphic, they are best assigned to stem group Rheidae. D. fragilis has a narrower beak and somewhat less reduced humerus than extant Rheidae, but otherwise is quite similar in the morphology of the known bones. The distal tibiotarsus lacks a supratendinal bridge. Compared with other Paleogene palae-ognathous birds, the osteological features of D. fragilis are most similar to those of the Palaeotididae and Remiornithidae (Fig. 5.2). As in the latter two taxa, there is a marked fossa (sulcus extensorius) along the dorsal surface of the tarsometatarsus.